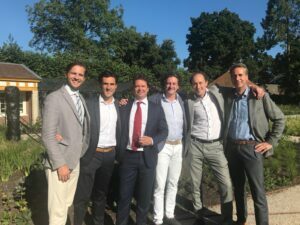 At Friday 29 June, in the beautiful Singer Museum in Laren, the lustrum of the Dutch Orthopedic Trauma Association took place. Circa 100 delegates gathered for the lustrum celebration that existed of a highly interesting scientific program and a festive walking dinner. For the scientific itinerary several renowned international speakers came to the Netherlands give a presentation within the theme “From worst case to best practice”. The coordination of the scientific program was one of the many things Excel organized. They contacted all international speakers and guests and arranged their travel itinerary and stay. Additionally, Excel set up and organized an exposition with four sponsors. After a day of interesting lectures, the day was ended in the sun-drenched garden of the museum. Drinks with tasty appetizers and a delicious dinner made by caterer Maison van de Boer were served on the terras. The day was a great succes. Looking for an event or congress organizer? Please do not hesitate to contact us. We are happy to help you and exchange our thoughts with you. Excel organizes diverse congresses, courses, fellowships and other scientific gatherings, but also Excel carries out the office management for the Dutch association. The development and maintaining the website, handling urgent matters, answering questions of members via email and phone and supporting management of the board of the association are daily tasks of Excel. Are you looking for a partner for your association? One that fully supports you and takes work out of your hands? One that organizes your gatherings and other events? Excel is here for you! You decide in what extent we support you. Look into the rest of our portfolio to get an impression of our work or look at our services.